Brisket is an underrated cut of beef which comes from across the length of the chest area just under the shoulder of the animal. The position of the brisket makes for a quite firm piece of meat, a texture which benefits from long, slow cooking. It also makes it a cheaper cut so perfect for family meals or when you have a large number to feed. Brisket can be oven braised, poached or pot roasted or cut into chunks for a stew, though for me cooked whole is always better. 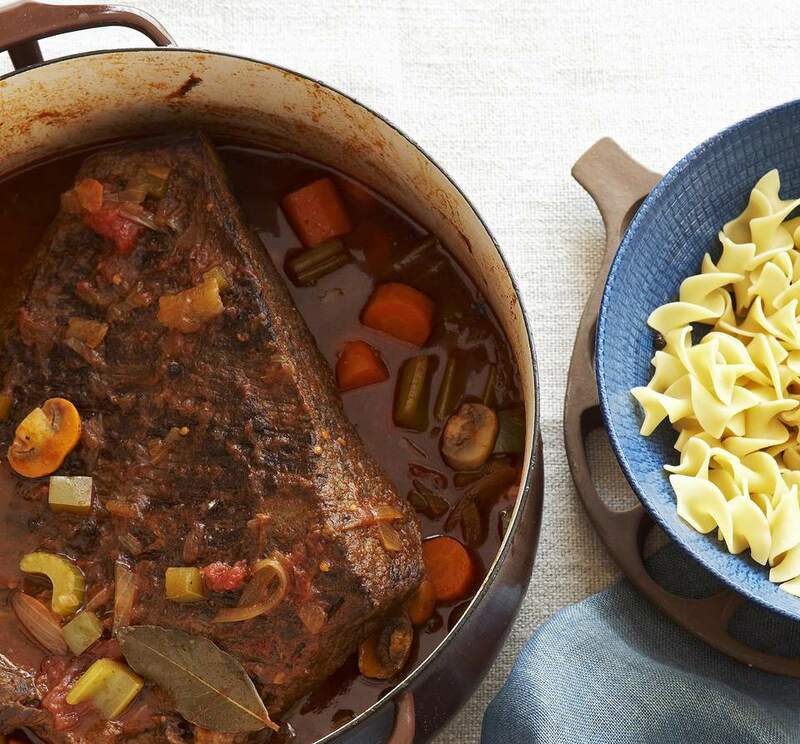 This slow cooked brisket recipe keeps the boned brisket whole and cooked with winter vegetables, beef stock which results in not only tender beef but a rather tasty rich dark gravy. It is lovely as the alternative to a Sunday Roast served with Yorkshire Puddings and mashed potatoes. For a midweek supper, serve with noodles or pasta. Place a large oven proof casserole over a medium heat. Add the oil and heat to hot but not burning. Sear the brisket in the hot oil turning until all the sides have been sealed and are lightly browned. Remove the brisket and keep to one side. Add the carrots, onions and celery to casserole dish and stir, cook for 2 - 3 minutes. Turn the heat up to high and once hot, add the red wine. Stirring constantly, cook until the wine is all but reduced to a glaze. Lower the heat, sprinkle over the flour and stir. Cook for 2 minutes. Lightly crush the garlic with the back of a knife and add to the casserole dish. Add the brisket, beef stock and bay leaves. Bring to the boil stirring constantly. Once boiling cover with a lid and put into the preheated oven. Cook for 15 minutes then reduce to 135 °C/ 275 °F/gas 1. Cook for cook for 3.5 to 4 hours or until the brisket is cooked right through and tender. Check from time to time to make sure the gravy isn't drying up. Lower the temperature and add a little boiling water if it is reducing too quickly. Take the casserole dish from the oven, put the brisket on a carving board and cover with foil to keep warm. Add the parsley and the mushrooms to the casserole dish. Raise the heat and bring the gravy to the boil, reduce to a simmer and cook for 5 minutes. Taste for and adjust the seasoning with salt and freshly ground black pepper. Slice the brisket into chunky slices, it will break up a little but don't worry too much, that's the nature of brisket. Serve with creamy mashed potatoes and fresh seasonal vegetables.